...throw the whole damn mess out and try to forget about it. You thought I was going to try again eh? Yeah...my fragile little ego can only handle so much failure. I'm really, really, *really* not a baker or patissier or any sort of master of desserts. I've been fooling myself lately into overstepping my skills....so it was a little humbling this morning when I tried to pry open my springform pan. I can't say I was surprised to see a pile of non-descript fruity goo, but I was still annoyed. So it was time for something completely different. And something guided (no randomly trying to triple a metric recipe and just substituting whatever). Tonight's dinner was a take on hubs latest health kick. Hubs tends to be a little more analytical about our diet than most men generally seem to be. While other men are picking up buckets of KFC, or downing platters of nachos and wings....hubs is picking up lists of superfoods and reading about the latest food scare (oh, and for the record, I'd rather die young than eat boiled, poached and steamed food for the rest of my life). Don't get me wrong, he still eats his fair share of snacky foods, but he's always interested in stuff that's going to be healthy and tasty. So his latest pet peeve is sodium. And he definitely has a point. It's not a question of putting down the salt shaker. 90% of the sodium/salt we ingest is added to our food before it even gets to the table. It's almost like nutritional terrorism - hidden in our foods, wreaking havoc on our bodies and we barely even notice its presence. - basically, any sort of appetizer or snack is BRUTAL. You can read even more about the evils of salt HERE. Tonight, I took the reins (right after going grocery shopping - woohoo! ), and made this fabulous dish from epicurious.com - it's low in sodium, and overall super-duper yummy. There are healthier meals out there (coconut milk is not exactly the best thing in the world for you), but this is so yummy.....and just pretty! It's vegan too. Can't go wrong here. 1. 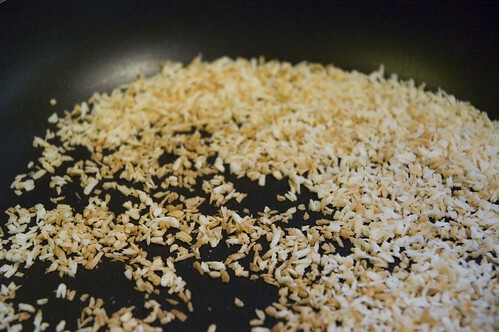 Stir the shredded coconut in a small nonstick skillet over medium heat until light golden, about 5 minutes. Transfer to bowl. (or be lazy like me and just leave in the pan)! 3. Meanwhile, puree cilantro, 1/2 cup coconut milk, 1 teaspoon ginger, lime juice, and half of garlic in blender. 4. Heat oil in large nonstick skillet over high heat. 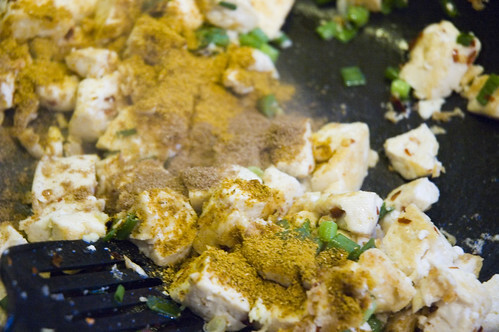 Add tofu; stir-fry until golden, about 6 minutes. 5. Add onions, curry, cumin, red pepper, remaining ginger, and remaining garlic. Stir-fry 1 minute. 6. Stir in tomatoes, sugar and remaining coconut milk. Season with salt and pepper, if desired. 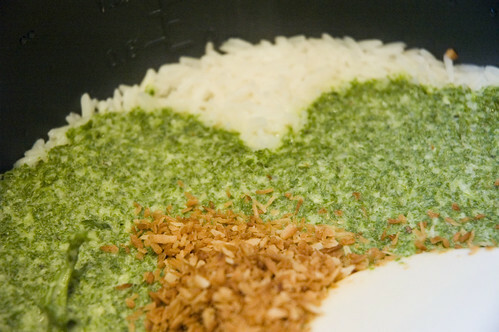 Whie this bubbles away, stir the coconut/coriander mixture into the rice, along with the toasted coconut. 7. Divide rice among 4 plates. 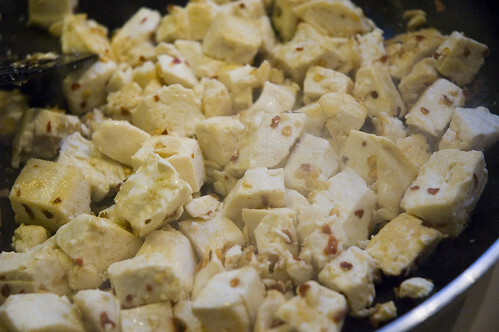 Top with tofu mixture. Sprinkle with peanuts. You know you want to make it. And if you're truly terrified of tofu, you could easily substitute chicken or some other meat. But the tofu is pretty good - even hubs had seconds (this from a man who acted like I was conspiring to kill him when I hid strips of veggie burger in a wrap two years ago). Sorry your desert didn't turn out. Cakes in general frighten me. I've been reading for a while (sorry, I'm just a lurker by nature) and I've really felt inspired to try some new recipes and get out of the food rut we were in (chili, tacos, wraps, stir fry, pasta, rinse repeat). I made the Moroccan stew from Crazyplates last night and we really liked it - have you tried that one? I had the same reaction to that news story. Ugh. No boiled meat for me, thanks. I'm on the same wavelength as your DH about sodium. I was appalled to find out last year how much sodium is in chicken stock cubes or powder and I just started making my own stock. It really doesn't take that much time and it's so much better (I do add salt, but just enough to get the right flavour). I always keep about 8 cups stock in the fridge to make a soup that week and the rest I freeze in smaller portions to use in rice or any other dish. I've been trying variations of your past recipes all last week -the black bean burrito was really yummy!!! I love those chipotles. I made it with stewing beef though (I didn't realize I ran out of chicken until I was ready to cook). Will have to try this one soon - but with chicken probably. DH detests tofu and won't eat it unless it's 'hidden' (and if I don't tell him haha!). I'm not a baker either. DH doesn't like anything that has a cake batter or anything of that texture. That includes muffins, banana bread, cakes of any kind. bah. Yeah, I find the sodium thing so weird -- I love salt on certain things, and am definitely way more salt than sugar fiend. But recently when we were heading to the cottage for the weekend after work, I wanted to avoid snacky food and thought I'd just get a soup on the road. I tasted it and wanted to seriously vom with the crazy sodium overload. Freaky. haha... i think ur n me have something in common...health freak hubbys ! (beer doesnt count of course...its a health drink), love the green rice...would'nt it be a bit heavy though...all the coconut. Another lurker/consistent reader here - I'm with you on the whole boiling, steaming, stewing thing...blargh! 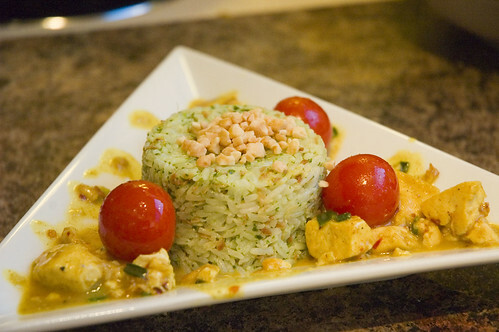 Thanks for the inspirational dishes - I've tried more than a few of them and they're great. Keep them coming! 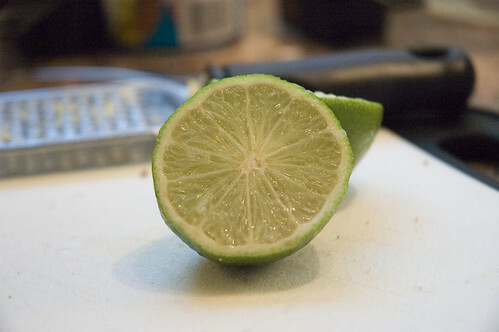 I think I may make this tonight. Have to add that anyone who thinks Swanson's XXL Hungry Man dinners might be healthy has some serious food issues. Ha. Another sodium-filled nightmare is any kind of ramen noodle. They're deep fried to make them crispy and just chock full of salt. I haven't had them in years since I actually read the label. 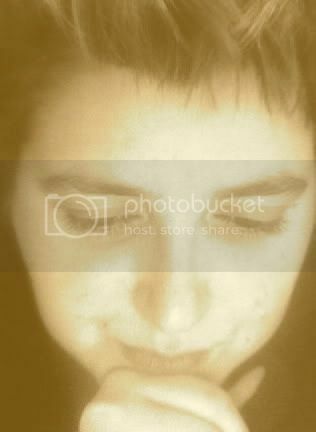 simone - I agree. Cakes are scary. I'm sad to say I don't have Crazy Plates. I have the other two, but that one is missing....and yeah...boiled food. MEH. lesley - funny how guys can sometimes be, eh? Hubs used to subsist on Lipton Sidekicks...I saved him. Glad to hear you've been trying some recipes - that sweet potato burrito recipe really is a winner. I LOVE them. You should try sneaking some of the veggie ground "chicken" into something. It's really good. foxy - isn't it gross just how much sodium can be crammed into some foods? kate - yeah, it's not crazy diet food, but it's yummy. You can use light coconut milk to lighten things up. doctor T - I shudder to think that I used to eat packages of "raw" Ramen noodles in elementary school. It was the 'in' snack. Even worse was chugging the salty bouillon at the end. EGADS my arteries! I made this a while back (I believe on the night I posted about thinking about making it) and it was good, but not zippy enough for our tastes. I think I may have under-chili-peppered the tofu? I'd try it with squash instead of tofu next time.